The backbone of the Synagogue, Shacharit, Mincha and Maariv take place during the week in the Beit Midrash (located to the right when you enter from the parking lot). Shacharit services are Monday and Thursday at 6:35 am, Tuesday, Wednesday and Friday at 6:45 a.m. and Sunday at 7:30 & 8:30 a.m. Each weekday morning a second Shacharit service meets at 7:45 a.m. in the Braun Youth Center. On Rosh Chodesh and fast days Shacharit begins at 6:30 a.m. On Shabbat the Hashkama minyan begins at 8:00 a.m., the Main Minyan begins at 9:00 a.m. and the Beit Midrash Minyan at 9:15 a.m. For the schedule of Mincha and Maariv services please see the weekly Shabbat Announcements or call the synagogue office or click here for our daily davening times. Emailed each week and also distributed in Shul every Shabbat, the Shabbat Announcements contain a Dvar Torah of the weekly Torah reading, the time schedule for services throughout the week, and announcements of interest to synagogue members. If you have an announcement which you would like published in the Shabbat Announcements, it must be submitted to the synagogue office by Thursday. To sign up for the Shabbat Announcements mailing list, please email our Executive Director, Mark Twersky, at mtwersky@gns.org or click here. Donations to the various funds of the Great Neck Synagogue can be earmarked acknowledging a special life cycle event or other important occasions. Acknowledgments are sent to the appropriate family as an indication of your consideration. Donations are made to acknowledge birthdays or yahrzeits, births or deaths, graduations, professional accomplishments or simply as a nice way to say thank you to someone special. Click here for a listing of the various synagogue funds. For more information on donation cards please call the synagogue office (516) 487-6100 or click here to make a credit card donation online. SCOPE Magazine is our remarkable synagogue book. New issues are organized and printed three times a year, Rosh Hashanah, Chanukah and Pesach. Current articles from our editors and congregants, sharing history, travel, divrei Torah and life experiences are truly engaging. Schedule of activities, events and community news, halacha for the upcoming holiday are included in each publication. SCOPE has become the showcase for our member’s intellectual scope. We encourage your participation and ask you to send your articles and advertisements (price list is available upon request) to Diane Rein at drein@verizon.net. Click here to read SCOPE online. Published once a year before Shavuot, this booklet is used for the Yizkor service each time it is said in Shul. You can include the names of relatives you would like to be memorialized in this booklet by returning the information form which is sent to synagogue members before the Book of Remembrance is published each year. Hashem visited Avraham after his Brit Milah. The kindness that Hashem displayed has inspired the Jewish people over the centuries to show kindness to those who are ill. This significant mitzvah has always been a part of the Jewish heart and soul. The Bikur Cholim of Great Neck was established in 1988. Our members bring comfort, hope and understanding to the sick and/or elderly. We often shop for them and at times take them to their physicians. Sometimes volunteers will shop with the disabled or depressed patient. During the holidays, our volunteers blow shofar for shut-ins and help the sick perform religious obligations during Succot and other holidays. When possible, we help the patients prepare for Shabbat. We are members of the Coordinating Council of the Bikur Cholim of Greater New York, devoted to “compassionate care for the sick, frail and homebound.” We welcome your participation and look forward to hearing from you. If you wish to volunteer or need help yourself or for a loved one, please contact Diane Rein (516) 522-1262 and click HERE for volunteer form. . The GNS Hunger Initiative encompasses more than a dozen groups and approaches to helping hungry families throughout the community and worldwide. Donate extra food to our established pantries, your time in stocking and delivering food and helping in soup kitchens. These programs continue all year long including holiday times. To help donate your time, food or money, please click here to learn more or make a donation. Alternatively, please contact: Cindy Hodkin (516) 482-7771, Nechama Liss-Levinson (516) 773-3572 or Michelle Berman (516) 829-1942. Traditional bronze memorial plaques to be affixed to the memorial tablets in the Main Sanctuary may be ordered through the synagogue office. A light is lit next to the plaque during the month of the Yahrzeit and special memorial prayers are recited. This is a beautiful way to memorialize family and friends. Please call the synagogue office for more information. Great Neck is proud of its outstanding Chevra Kadisha under the leadership of its founder, Jerry Weinstein. The Chevra assists in all needs of the deceased, including removal, shemirah and taharah. Members of the community are encouraged to volunteer for this important communal institution, and should click here or contact the Synagogue office for more information or Jerry Weinstein at (516) 487-0023. During this time of need, the Great Neck Synagogue membership will provide daily minyanim in a home of mourning, as well as the first meal offered to the mourners upon their return from the cemetery. Our volunteers will help you and your family through this difficult time, providing as much assistance as needed. Upon notification of a death, and time permitting, the synagogue activates its automated dialing program which can reach all of the members of the congregation by phone with a recorded message regarding funeral arrangements. Additionally a Shiva notice is sent to the membership informing them of the appropriate details. To sign up for the community wide Chevra Kadisha mailing list, please email chevrakadishagn@aol.com. To make a donation to our shiva fund please click here. This committee reaches out to families at a time of loss to help them deal with the myriad practical details of setting up and running a shiva house. If the family is interested, shiva coordinators will be appointed to coordinate meals and other assistance donated by community members. Volunteers will be available to help serve meals and address other family needs, as required by each situation. For more information, please contact Sharon Goldwyn (917 287 7334) or make a donation by clicking here. The Synagogue also maintains a complete record of family Yahrzeit observances and notifies its members as the observance of a Yahrzeit approaches, as well as listing upcoming yahrzeits in the weekly Shabbat announcements. We would also be pleased to prepare a listing of Yahrzeit dates for the next several years should that be helpful to you. Great Neck Synagogue is proud to have Lederman Caterers as our official “in-house” caterer. Lederman caters beautiful kiddishes, luncheons, dinners and dessert parties which have made the GNS the location of choice for special events. For further information, please contact Lederman’s office at GNS (located next to the Sisterhood Gift Shop, by the parking lot entrance lobby) (516) 773-3000 or (516) 466-2222. Click here to learn more about all of our sponsorship opportunities, or call our Executive Director, Mark Twersky, at the synagogue office (516) 487-6100. Sponsoring a Kiddush is a wonderful way to celebrate a significant event in your life and to share it with friends and family. The names of the sponsors and the particular simcha or event is listed on the front page of the weekly Shabbat announcements. Click here to learn more about sponsorship opportunities. 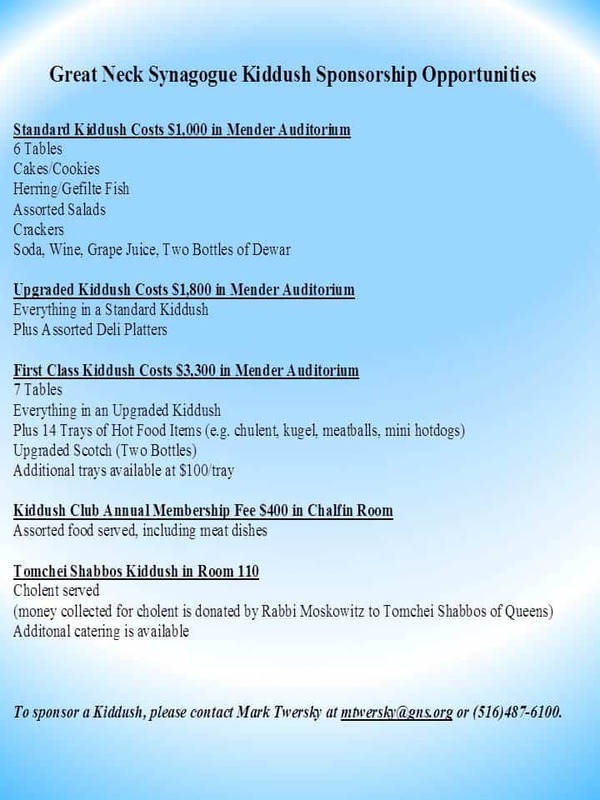 To learn about kiddush options click HERE. Celebrate an occasion, honor an event or dedicate in memory by sponsoring an arrangement of flowers for all to see upon our bima. This can be done in either our Main Shul or our Beit Midrash. Click here to learn more (scroll down to the Bima Flowers option). Be a sponsor of a session of learning. The shul features many honored scholars as guest speakers of Seudah Shlishit. Click here to learn more (scroll down to the Seudah Shlishit option). This carved wooden sculpture is located in our main lobby and this unique Tree of Life commemorates all life cycle events. This is a wonderful way to celebrate life such as a wedding, birth or birthday, bar or bat mitzvah or an anniversary. Starting from $500 for a beautiful engraved copper leaf to a plaque on a branch or a trunk. Click here to learn more. You can purchase a siddur for $45 or a chumash for $60 to honor or memorialize someone. A lovely book plate will be placed inside the cover. Click here to learn more (scroll down to the siddur and chumash options). warm and friendly atmosphere. Click here to learn more (scroll down to the Sunday morning breakfast option). You can honor your child’s birthday or special occasion by sponsoring youth snacks (cookies and candy) for the youth department on Shabbat morning. Please call the office to learn more.